I can’t believe it’s already been three months of living in Vancouver! My how time flies! Given how much you liked this post on my fave healthy restaurants in Toronto, I thought I would do a post on the best healthy restaurants in Vancouver. They are organized by neighbourhood. My only beef with this vegetarian spot (hehe) is that they don’t do takeout when they’re busy. The Naam is actually open 24/7 so if you were out late at night and needed a healthy late night snack, this is your place. I am a fan of their brunch, but also love the Naam salad as a go to dinner. 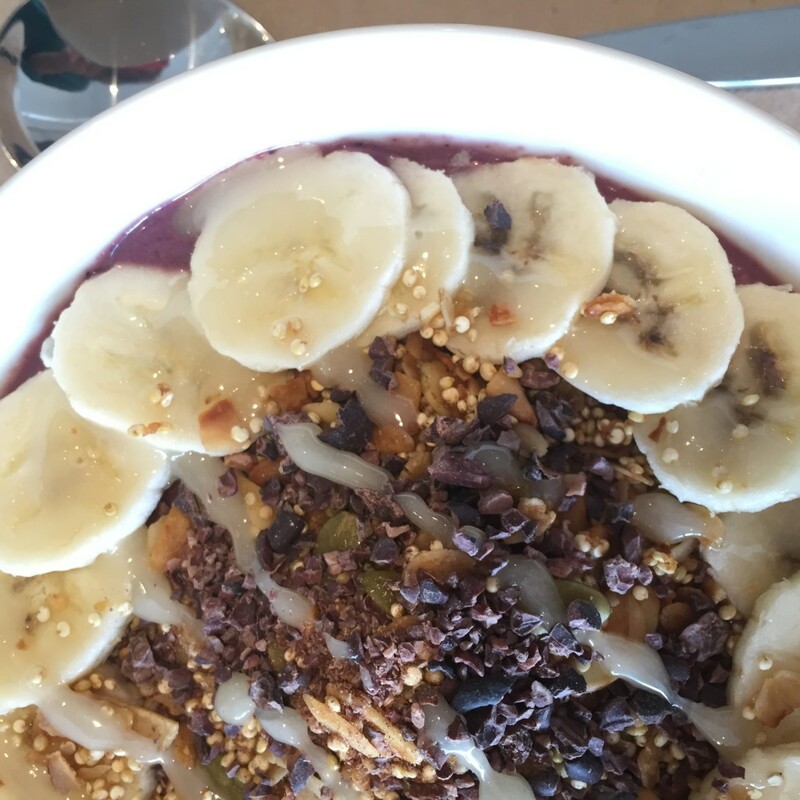 I frequent this place too much, but their acai bowls (shown below), which are even better than the real Brazilian ones have me hooked. I’m also a huge fan of their Number One juice – an array of greens that gives you a nice energy boost! Nuba is a Vancouver chain (4 locations I believe) serving healthy, fresh Lebanese food. It was a go to when we were first living in Yaletown, and the Lamb Kafta is to.die.for. They have other locations around the city as well. For any gluten free folk, SMAK is unreal. It’s an entirely 100% gluten free place that offers pre-made food, mostly to go. Their curries are unbelievable, and they also have some great smoothie options. I stumbled across this place when I was walking on Nelson one day, and have to say that for a snack or a treat, it is amazing. I have had their fresh spring rolls, which were almost enough for a meal, and their chocolate granola bars, that are healthy and low sugar. Peqish has some healthy options too. The best options are their salad boxes with a protein boost. While their sandwiches are good quality for sandwiches, careful of too much bread and the inevitable 3pm slump. **UPDATE: I recently ate at Heirloom and had a terrible experience so have removed the original review I had. They were not good at dealing with someone who was eating gluten free, and as a result, I was incredibly sick. I wouldn’t recommend it for anyone who is Celiac. I’ve only been to Acorn once, and I went with the lovely Eat Spin Run Repeat and two friends from Vega. I would call this high end vegan dining. I was craving some comfort food and had the gluten free, vegan mac and cheese and it was DEEElish. This isn’t a place I would necessarily take someone who is a full on ‘meat only’ eater, but if you have some friends that like vegetarian/vegan occasionally even, this is a great spot for a nice dinner. I went to Graze with friends for dinner, and have to say that I was pleasantly surprised. It wasn’t very busy on a Friday night, which tends to be a warning sign for a bad restaurant, but the food was amazing. For me, the best part was all of the gluten free comfort food I could have. For example, I had savoury crepes for dinner, but there were also gluten free perogies on the menu. The highlight though, was the gluten free apple pie! After a hike through Lynn Valley, my fiancé and I came across this gem thanks to good ol’ Yelp. IT did NOT disappoint. I had this delicious salad and also picked up the amazing My New Roots cookbook while I was there. I’m sure I missed some being so new to the city, so let me know what the best healthy restaurants in Vancouver are.